Everyone knows that being bad isn't good. That's why they call it "being bad." But is it still bad when you look devilishly good? Think about that while you're wearing this Plus Size Devil Costume to your Halloween party! Of course, if you're the one at the party who's got the horns, then your job is to look as dark and classy as possible; and this costume lets you look that way without giving up your soul in exchange! 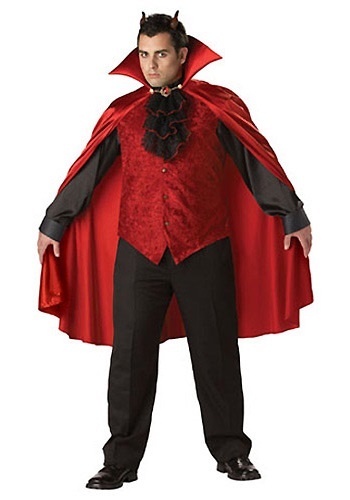 This red satin vest has adjustable ties in back and gold-tone buttons in front, and matches the included high collar cape and horns, for a menacing and mysterious fashion. While a sinister goatee (real or fake) isn't required to make this ensemble seem devilish, we happen to know it makes being bad a lot more fun!